plus a diagonal arrow. We wonder what lettering the brick red paint is obscuring to the left and below the word 'less'. Followed by a silhouette illustration of a seated customer have shoes fitted by a kneeling assistant; then a bit of modern spray-can grafitti over the lower left of the picture. 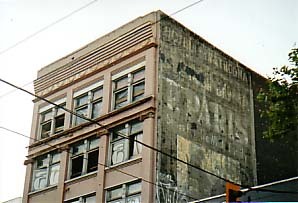 This is a less clear example than those above, but shows signs of an earlier generation of lettering. 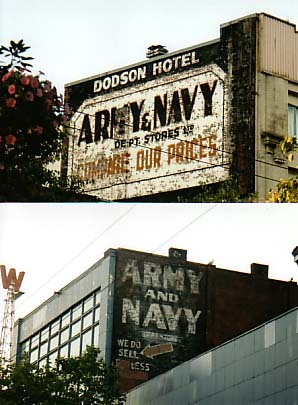 'Hotel Strathcona' in larger capitals seems to have once sat on the line of the words 'home of'. 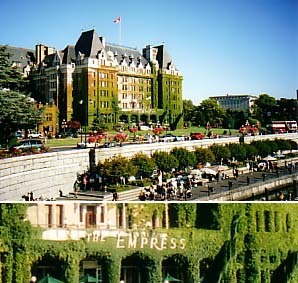 Then we move across the water to Vancouver Island with its major city, Victoria. The clue is in the name: indeed this is more British than the British. No wonder that this huge area of Canada is called British Columbia. 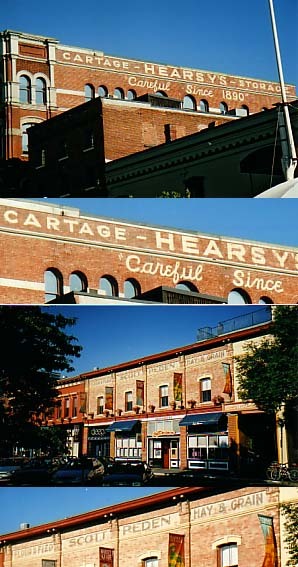 The period buildings are handsome colonial versions of Victoriana, replete with fine lettering here and there which looks as if it is not merely tolerated, but actually conserved for the twenty-first century inhabitants. and on the cornice of the entry at lower right the word 'Market ...' which looks contemporaneous. Perhaps some Victorians (natives of Victoria) will get in touch (link at foot of page) to let us know the rest of the sign. with its superscript 'The' followed by 'Empress' in large and small caps; the 'R' having a kern which travels under the following 'E'. The whole effect is rather quirky and unbalanced, but I dare say the sign is original as is the Virginia creeper which clothes much of the frontage. Incidentally, the whole (very large) Vancouver Island is full of an interesting blend of colonial names of species (particularly Scottish ones such as the Douglas Fir) and landmarks (Campbell River) and native American names and artefacts. Quickly back to Vancouver city for a glance at surviving architecture redolent of the paintings of Edward Hopper (photographed appropriately in low evening sunlight). No lettering here, but we couldn't resist. 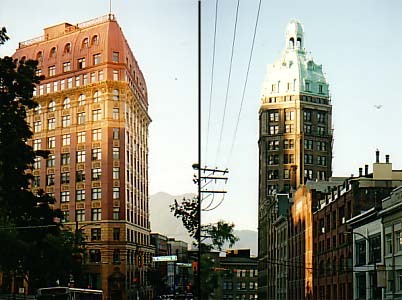 The impressive tower on the right was the home of the city's newspaper. Gotham City or Metropolis? 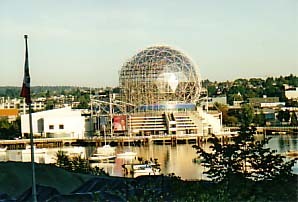 And on the waterside behind the Sandman Hotel and a large entertainment venue, what could be nicer than a fine geodesic dome? Buckminster Fuller would be proud. Borin Van Loon has a personal interest in domes and their construction.